Read more: “A Child Ghost, an Escape and a Watery Haunting on Curaçao” a fairy tale written exclusively for T.
This Balinese-style beachfront property is the island’s only five-star resort. At its center, a man-made island, built as a wave breaker, forms a tranquil lagoon surrounded by a raised tropical garden. Stone water basins mark the entrances of the 23 airy suites and villas, many of which have either shaded terraces overlooking the garden or private plunge pools, and the five luxurious beachfront suites, which feature vaulted ceilings and oversize canopy king beds, have outdoor bathtubs carved from Javanese volcanic rock. Curaçao’s oldest hotel has had many lives: Originally a country home for English and Dutch governors, it was later repurposed as a boarding school and then a private hospital. The property became a hotel in 1959 — the original owner named it after the medieval Spanish town of Ávila — and today, this 150-room resort still maintains its stately Dutch colonial facade, built in the 1780s. Opt for a room in the newly restored oceanfront Blue Wing, which lines a pier overlooking the property’s private beach and lagoon, and be sure to order the Curaçaoan delicacy of keshi yena (baked cheese stuffed with spiced meat) at the breezy alfresco restaurant, the Pen. Located on 27 acres of the 2,000-acre Santa Barbara Plantation, this luxury resort feels like its own secluded island escape, with 350 Caribbean-facing modern guest rooms, a Pete Dye-designed championship golf course and a long sandy shoreline punctuated by unusual rock formations and caverns to explore. Don’t miss an herbal treatment at Atabei Spa, which offers a traditional healing experience rooted in plant medicine first used by the island’s Arawak Indians. This tapas bar and kitchen in Willemstad, which opened last April, is Curaçao’s first gastropub. Latin-Caribbean small plates like corn-nut-topped tuna tacos and mango-lobster ceviche complement a cocktail menu heavy on pisco, rum and tequila. Each dish — served in a diminutive, dimly lit space with a wooden bar made of salvaged lumber sourced from the island’s colonial buildings — comes with a suggested cocktail pairing. You can also craft your own highball with one of the bar’s housemade sodas: grapefruit-basil, watermelon-mint, hibiscus-cranberry and ginger-cardamom. The coffee aficionado Danny Willems and the pastry chef Igmar Comenencia teamed up to launch Curaçao’s first specialty coffee bar in June. Housed within a restored 18th-century Dutch colonial mansion in Willemstad’s Pietermaai district, this raspberry-hued cafe features original ceiling frescoes and mosaic-tiled flooring, as well as a retrofitted, 130-year-old cash register that Willems’s grandmother once used at her bar in Amsterdam. The menu ranges from espresso and pastries to tuna sashimi poke bowls, which guests can enjoy on the cafe’s shaded front terrace. Named after the word for “eat” in Papiamentu — a local language of the ABC Islands — this split-level, Caribbean-fusion restaurant is known for its local sourcing, overseen by chef-owners David and Susan McHugh. Slow cooked braised duck leg and peppered hanger steak are staples, while seafood dishes change according to the catch of the day. When red snapper, a local delicacy, is on the menu, the fish is fried from gills to tail and served whole. Pair it with a craft beer or a South American aged rum — the Venezuelan Diplimático or Colombia’s Dictador. Roughly every two weeks, Venezuelan sailors make a 10-hour, cross-country voyage to Curaçao to form this floating market, continuing a 100-year-old tradition. Docking just beyond Willemstad’s Queen Emma Bridge — the only floating pedestrian pontoon bridge in the world — the wooden boats are connected to mainland stalls, shaded by colorful tarps, where vendors hawk bananas, avocados, papayas and red and yellowtail snapper. A short drive north from Willemstad, the Nena Sanchez Gallery — housed within Landhuis Jan Kok, an 18th-century plantation once owned by the island’s most infamous slave owner — showcases the original works of the late Curaçaoan artist Nena Sanchez, as well as reproductions for purchase. The former Miss Curaçao was known for her bold paintings inspired by the Caribbean Sea and its surrounds: banana palms, colonial cottages and figurative female forms accented by tropical flowers. The white adobe structure is surrounded by kadushi cactuses and offers views of the flamingo-studded salt flats of St. Marie Bay. This deserted coral atoll, known as Little Curaçao, is a tropical oasis accessible by a two-hour catamaran tour. Located less than 8 miles off Curaçao’s eastern tip, the island is ringed by unspoiled beaches and is the site of a ghostly pink 1850s lighthouse, one of its only structures. Divers and snorkelers will find the wind-swept southern shore alluring for its myriad shipwrecks and an underwater cave system frequented by sea turtles, triggerfish and grouper. 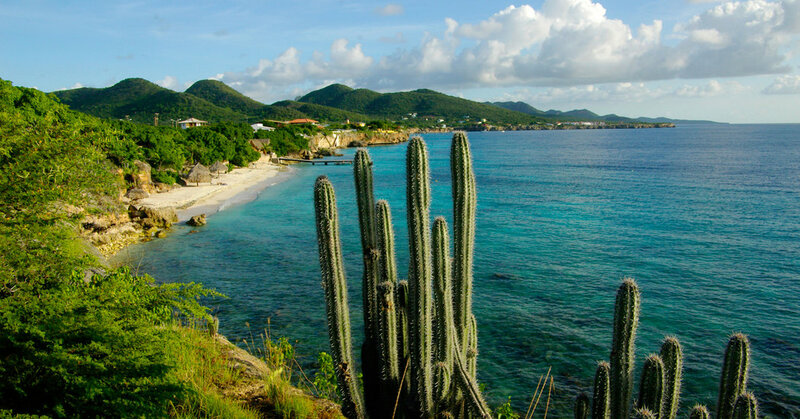 Beyond Christoffel National Park, an expansive oceanfront preserve with over eight hiking trails, is Westpunt, the island’s most western point, where Curaçao’s postcard beachscapes abound. Swim the translucent waters of Playa Knip, cliff jump at Playa Forti or bring a picnic to Grote Knip, a small curving white-sand beach lined with palapas. To see the area’s diverse marine life, visit Playa Piskado to swim with sea turtles or take a day trip to Kura Hulanda Lodge to explore Curaçao’s leading dive site, Playa Kalki, known for its abundance of lobster, moray eels and star-shaped coral.